Current information can be obtained from the articles of periodicals. Therefore periodicals are of great importance where research is concerned. 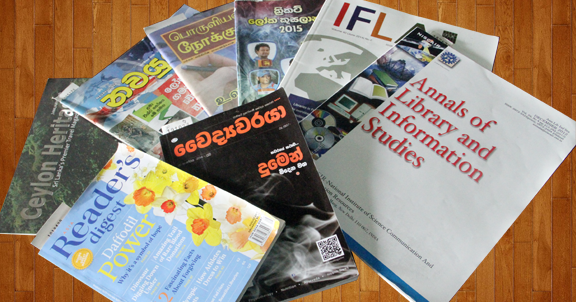 All periodicals published in Sinhala, Tamil and English in Sri Lanka, are acquired by the National Library, according to its acquisitions policy. Foreign Periodicals too acquire in the fields of Social Science, humanities, Science and Technology and Library and Information Science. Periodicals are acquired through purchases, exchange and donations. Holdings of the periodicals comprise of a large number of periodical titles.